Most people know Jeff Smith from his masterful Bone graphic novels, but add him to the list of acclaimed authors for beginning readers. 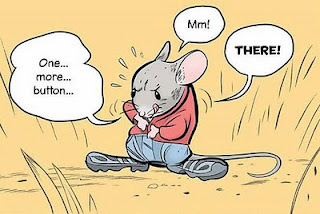 Little Mouse Gets Ready, a 2010 Geisel Honor Book, tells the simple story of Little Mouse getting ready for a trip to the barn with Mama and his siblings. Of course, as it usually is with little ones, telling the story is much easier than the act of getting ready. “Oh boy, I love going to the barn!” says Little Mouse. “Yes sir! There are LOTS of places to run and hide in the barn!" 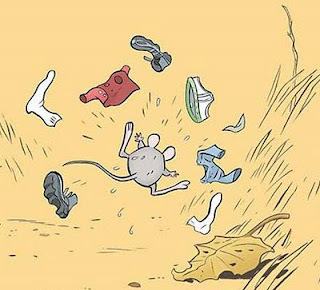 Little Mouse lays out everything he needs to get ready: underpants, socks, pants, shoes, and shirt. Starting with the underpants, Little Mouse explains to readers that some items are easy (underpants) and some items are hard (the second arm in a shirt) and some items are downright tricky (buttons). His narration of the process is sprinkled with the great stuff he’ll get to do at the barn like eat the seeds dropped by the chickens and the oats spilled by the horses and swim in the cow’s water. Finally – finally! – Little Mouse is ready. “One… more… button… Mm! THERE! I did it! I’m READY!" 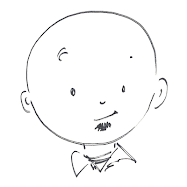 I wonder when a graphic novel will be recognized by the Caldecott committee. I’m not an expert on Caldecott criteria, and someone fill me in if graphic novels would be ineligible, but one item stands out: “Delineation of plot, theme, characters, setting, mood or information through the pictures.” Little Mouse’s response to Mama’s no-clothes declaration is wordless, but it says plenty. Young readers will successfully read the text of Little Mouse Gets Ready. More importantly, they will enjoy the book repeatedly as more details of the seemingly simple illustrations are discovered upon subsequent readings. Toon-Books have found a flawless formula and the scientists – er…authors – to masterfully mix the ingredients into beginning reader perfection. The proof lies not only in award recognition, but more so in the enjoyment and laughter of countless young readers.